US Rigging Supply offers a broad selection of steel and aluminum snap hooks, spreader bar hooks, rebar hooks, ladder hooks and scaffold hooks. We offer from accessory type, to tactical, ANSI Z359 and NFPA rated hardware. Strength options for snap hooks are up to 50kN, that’s over 11,000 lbs! 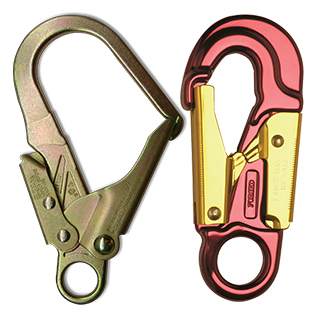 We also offer double locking safety snap hooks to support your needs.